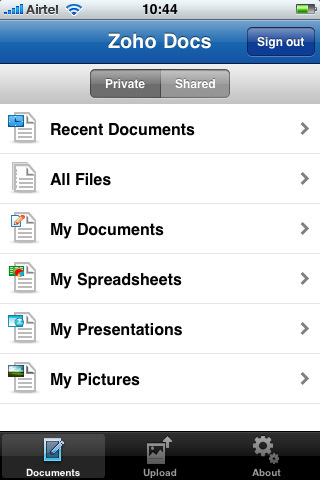 Zoho Docs for iPhone offers mobile access to your documents (available on the web at http://docs.zoho.com). Zoho Docs is an online document management application for individuals and businesses. This mobile version extends access to your documents to iPhone & iPod Touch. If you don’t already have a Zoho account, you can easily create one within the application. AppSafari review of Zoho Docs was written by Joe Seifi on July 10th, 2007 and categorized under App Store, Files, Notes, Productivity. Page viewed 6868 times, 1 so far today. Need help on using these apps? Please read the Help Page.